Trying to plan your kitchen remodel? Don’t bite off more than you can chew. The best way to go about it is piece by piece. Instead of focusing on the kitchen as a whole, think about the kitchen’s components independently. But what exactly are the components of the kitchen you should be focusing on? And what order should you tackle them in? Learn everything you need to know about planning your kitchen remodel in this week’s blog. Learn how to plan your kitchen remodel in our blog! The layout of the kitchen is the first thing to tackle. The most affordable method is to keep the current footprint of your kitchen. This means not moving the sink or range (so you don’t have to move water and gas lines) and not knocking down any walls to increase space. If you’re going to change the layout of the kitchen, consider where you can get the additional space you want, and how well this space will fit into the new kitchen. 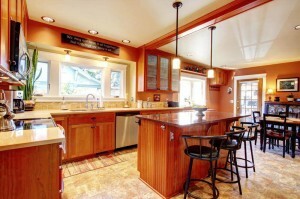 You want to have the new layout finalized before you proceed with any other planning for your kitchen remodel. The size of appliances will also factor into the layout of your kitchen, so figure out what appliances you want and where you want to put them when creating your layout. The next step is to think about the windows and doors in your kitchen. If you’re in an older home, you probably want to think about how you can modernize the windows by improving their placement to allow more natural light in. Replacing old doors with new ones is also something you should give some attention to, as the standards for door sizes have changed over the years. Ok, so the layout is set and you’ve figured out if you’re moving any windows or doors. Sizing your cabinets is the logical next step. One great tip for cabinets is to extend them all the way to the ceiling if possible. This adds storage space and prevents what usually happens with kitchen cabinets, which is that space on top of the cabinets is wasted. Sinks and countertops are a little more flexible, in that they don’t necessarily need to be replaced right away. For example, if you want granite countertops but can’t afford them right now, you can get a laminate countertop that can easily be replaced once granite fits into your budget. Plus, laminate countertops can be repurposed using tons of DIY projects. You can do the same thing with your sink if you want a high end model but don’t have the budget. Keep your current sink, and then install a new one once you’re ready. Flooring is the final major component of your kitchen remodel to think about. Now you’ll be able to perfectly match your flooring to your new cabinets and your new kitchen layout. This entry was posted on Tuesday, June 16th, 2015	at 8:26 pm	. You can follow any responses to this entry through the RSS 2.0	feed. Both comments and pings are currently closed.